How to import to Fiji? What are the import procedures in Fiji to move goods? Explain about import registration process, cargo movement to Fiji from overseas countries, Import delivery process in Fiji etc. Detail the import methodology in Fiji. This post explains about step by step procedures that need to be finished with Fiji government authority for importation to Fiji. Any natural or legal person can engage with export or import in Fiji. But according to products nature, certain goods for import may be subject to an authorization, license, rules of quality or packaging, standardization or special formalities. A registered trade with concerned license as per the business is must for exporting and importing of commercial products from and into Fiji. The importer can likewise declare the goods by presenting a finished Single Administrative Document (SAD form) to Fiji Customs. The Fiji Revenue & Customs Service is the major funder of the National Budget. Apart from its primary mandate, FRCS continues to partner and support other government initiatives as needed. Its strategic plan is aligned with the Government’s national plan to ensure sustainable and effective performance. The FRCS is responsible for collecting taxes and duties on behalf of government provide quality advice on tax and customs matter to all their stakeholders and facilitate trade and travel and also tasked to protect the borders. In many cases, the documentation may also vary depending on the country of origin or destination. The efficiency of the Customs Clearance process is depend on having the valid documents, the accuracy of the information provided in the documents as well as the promptness in submitting the documents and filing the necessary applications for the Customs Clearance. The importer should make sure that they made all of the correct import documents that are required to get clear the customs formalities, satisfy all compliance and regulations. This post explains about different phases in import process that every importer needs to go through in Fiji. What Licence requited to import in SUVA. What should I do to import goods in Nadi. How to get import licence in Suva. Procedure to get registration to import in FIJI. What Customs formalities required to import in SUVA. What should I do to import goods in Nadi. How to get import customs permission in Suva. Procedure to get customs clearance to import in FIJI. What are the documents need to be submitted to import at SUVA port customs. Which documents should I provide at Nadi customs port location for import. Documents need to move cargo out of customs at Suva port customs location. Formalities for import to LAUTTOKA. Procedures to import to SUVA. Need to import to FIJI. Explain to import to LAUTTOKA. Information to import to SUVA. Step by step process to import to FIJI. Methods to import to LAUTTOKA. Guidelines to import to SUVA. 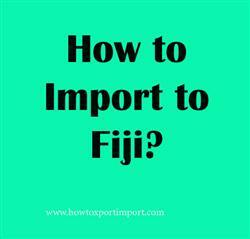 Please guide to import to FIJI. Help to import to. Procedures required to import to LAUTTOKA. Requirements to import to SUVA. Clarifications to import to FIJI. How can I import to LAUTTOKA. What should I do to import to SUVA.